Edo Ergo Sum: Organics! We don't need no stinking organics...unless we do. Organics! We don't need no stinking organics...unless we do. Well, the jury is out. Stanford University just published a study saying that the literature “lacks strong evidence” that organic foods are more nutritious than conventional. Some of you are probably kicking yourself for trading your child for that precious locally grown, organic tomato you bought last week at Whole Paycheck. While conventional farmers are doing the “Told-You-So” dance and bobo moms weep for their not-above-average children, is there still a reason to eat organic despite the study? Yes there is and it has everything to do with health. Despite the title of several headlines across major newspapers, organic food is better for you, and dare I say it, healthier for you. And here’s why. 1.Pesticides. According to the study, the researchers found that 38% of the food study had pesticide residues. This is in comparison to 7% found in organic produce. The researchers had basically poo-poohed the effects of pesticides because all pesticides levels were below the mark of what is accepted by Environmental Protection Agency (EPA). But what the researchers did miss was the long-term effects of pesticides. The longest term study was two years. Most cancers and other associated diseases with pesticide exposure take much longer than 2 years to manifest. And if you have kids, you should be especially worried. Because pesticides affect children more adversely than adults due to body weight, their even exposure that is under EPA levels for adults could be threatening for children. 2. Antibiotic exposure. While the researchers did acknowledge antibiotic exposure as a reason for going organic, what they did not explicate was the effect having antibiotic-laced meat in most grocery stores, namely, antibiotic-resistant bacteria. Currently, 80% of all antibiotics used in the US are for livestock use. And most of those antibiotics aren’t curing Elsie the cow of her nasty cold – they are used to promote growth or yield (e.g. milk or meat output) for animals. This rampant use of antibiotics in farms and ranches has only increased the amount of antibiotic-resistant bacteria. According to the US Food and Drug Administration’s own reports, common meats, such as chicken breast, ground turkey, ground beef and pork chops, have had increases of 26.6%, 55.3%, 11.5% and 17.5% in E. coli that were resistant to 3 antibioitic classes. Ground turkey, for some reason is the real winner with 28.2% of all samples resistant to four antibiotics classes. And that’s just E. coli. Just wait to you see the numbers for Salmonella. Until the FDA actually gets their act together about banning or severely curtailing sub-therapeutic use of antibiotics, the only insurance we have against the growing tide of antibiotic resistance is consumer power. If there is a growing market for antibiotic-free meat, then farms will realize there is a market for them. Yes, that means you will have to pay for your meat, but do you want to see salmonella become the next ebola? Only through collective action can we stop this public health nightmare. Relying on the vegan next door will not do the trick. 3. The Environment. Although there are plenty of people who argue this point, I think it’s worth reiterating. The methods used for organic farming protect soil fertility. 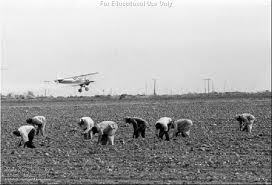 Any farmer will tell you the key to growing crops is in the soil. No soil equals no farm. The problem of conventional farming is in the snowball effect it has on the environment. By using destructive tilling practices and monoculture, conventional farming denudes and erodes the soils of not only the healthy bacteria and nutrients needed to grow crops, but insures that for the next generations that they will be dependent upon fertilizers to get the same yield. The run-off of fertilizers from industrial farms have been implicated mass pollution that not only destroys drinking water for residents but also creates “death zones” (or eutrophication) in bodies of water due to high concentrations of fertilizers. Organic farming insures that nutrients are not stripped from the soil. And healthier soil means less water, less erosion and often, better yields. Speaking of pesticides, they too cause a chain reaction across ecosytems by poisoning the entire food chain in a particular ecosystem. But there’s one benefit to pesticides – pests get heartier. In a farmers’ version of the nuclear arms race, heavy use of pesticides encourage pesticide resistance in organisms, which in turn only encourages heavier use of pesticides in another form. 4. Biodiversity. And of course, organic practices encourages biodiversity. Plants and animals, like people, depend on genetic diversity to keep a healthy population. Monoculture and industrial farming practices not only destroy the genetic variation that keeps plant species hearty, but also destroys the local ecosystem that provides homes, food and shelter for millions of other species in the area. 5. Taste. Last, but not least, taste is probably a huge reason why you should buy organic. While the jury is still out as to whether there is a statistically significant difference in flavor, but think about it. Because organic farmers have higher costs compared to conventional farmers, the need to take care of their crops is paramount if they want to market them. Seen all those pictures of workers dumping bins of green, unripe tomatoes into a giant truck? Try doing that with a ripe brandywine, and you can forget about selling it…because it will be tomato sauce. Furthermore, as freshness counts in good tasting produce, the quicker turnaround time between farm to market insures a better tasting product. What tastes better? A three-month old apple from Argentina or an apple you just got off the tree? Most conventional produce is grown for shelf-life-NOT for taste. Add the chemicals sprayed on most apples, and you’ve a recipe for avoiding apples. Going organic insures a steady market for farmers that care about good tasting food – instead of good for a trans-Atlantic-boat-ride food. Of course the irony in the Stanford study was that it proved what organic advocates said it was supposed to do: raise crops and livestock that have no exposure to pesticides, antibiotics and hormones. Organic practices are about METHOD-no one every promised a nutritional benefit. But in buying organics, you are buying for health – your health, public health and the earth’s health. And if don’t remember that, we’re going to be a lot less healthy in the future. There are several problems with the Stanford University study. And they are serious ones. But main gist here is WHY one should buy organic, NOT why Stanford researchers stink. But in the interest of scientific geekdom, I will go through the major problems of this study. First, the actual design of the study is problematic: the researchers did a meta-analysis of 240 studies and only used 17 studies actually looked at the effects in humans themselves. The biggest problems with meta-analysis is in selection and confirmation biases. We don’t know which studies why studies were accepted or taken for analysis, therefore researchers could potentially cherry-pick studies that confirm their original hypotheses. Also meta-analyses are not consistent in experimental assumptions and methods, including that of the meta-analysis itself. It’s like comparing apples and oranges. And then there’s the infamous Simpson affect. The studies themselves could all point to being statistically significant in one direction, but the meta-analysis proves otherwise. The best example of this would be Derek Jeter’s batting average. A study at Dartmouth looked at different ways of calculating Jeter’s batting average…only to conclude that different calculations gave very different answers. Furthermore, the study has some serious omissions in terms of what defines health. Only 17 of the studies included human test subjects, and of those 17, only three analyzed the health outcomes (of which two of the three looked at allergies-which has nothing to do with nutritional profiles of organic food). The lack of metabolic analyses in these studies is seriously problematic in determining the full nutritional or health value of organic versus conventional. Could our bodies use nutrients more efficiently if they were found in organic food form? What role does pesticides and antibiotics have in metabolizing food? Without a deeper analysis into those biomedical questions, the study doesn’t really help with the study of health outcomes. And lastly, the study didn’t look into the other motivators for eating organic. While the researchers in the study claimed that the question of organic foods’ nutritional content was a frequent one, people eat organic for plenty of different reasons, with nutrition probably being one of them. But by not investigating the actual motivators in buying organic foods, the researchers missed a real opportunity to pinpoint the why consumers make the food decisions that they do. Diseases linked to pesticide exposure include Parkinson’s, hormone disrupters or endocrine system imbalances (early puberty, decreased sperm count, etc.) and cancer (260 studies link pesticide exposure to cancer). For those interested in exploring the relationship between antibiotic use and public health, there’s a really nice piece done by PBS’s Frontline on the effects of sub-therapeutic use of antibiotics in farms on public health. There’s one more environmental benefit to organic farming: carbon sequestration. According to some studies, organic farming is better at capturing carbon than it’s conventional couterpart, thus making it a better weapon fight climate change. Unfortunately, there are not enough studies to make this a conclusive benefit of organic farming. But if it is true, organic farming could be another weapon against climate change.